I've been inspired by, and fortunate enough to study with David J. Marks at his studio in Santa Rosa, Ca. 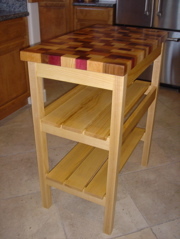 Here are some of my projects, many of which are based on furniture David built on his Woodworks show on DIY Network. 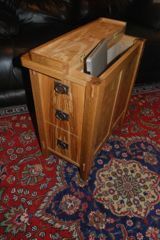 I made this end table to hold my laptop, which I use frequently. Unfortunately, I spilled my coffee on the laptop and fried it once, so I needed to make a coffee-proof place for it. Mouse over the photo to see where the laptop goes. This wine service cart is made largely from a used wine barrel. 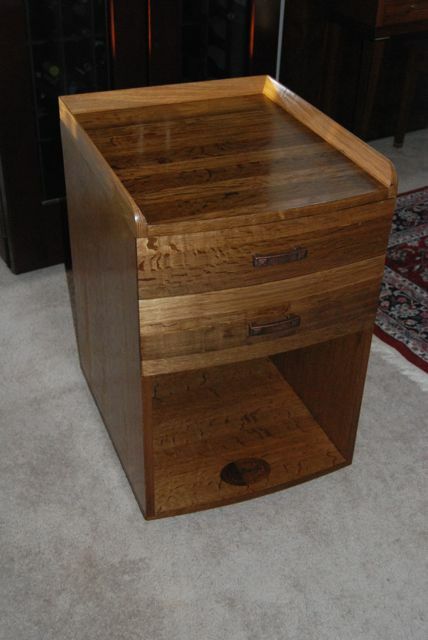 The drawer fronts are barrel staves, and the top is resawn staves veneered onto the top. The label from the barrel is inlaid into the bottom shelf. The entire project was fumed with ammonia. 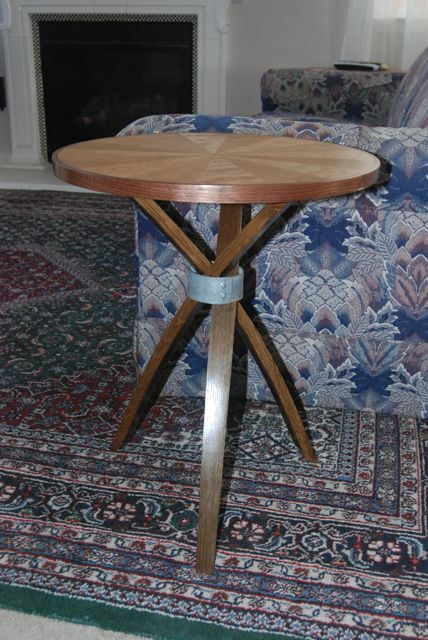 This table has barrel staves for legs, with part of a barrel hoop for decoration. 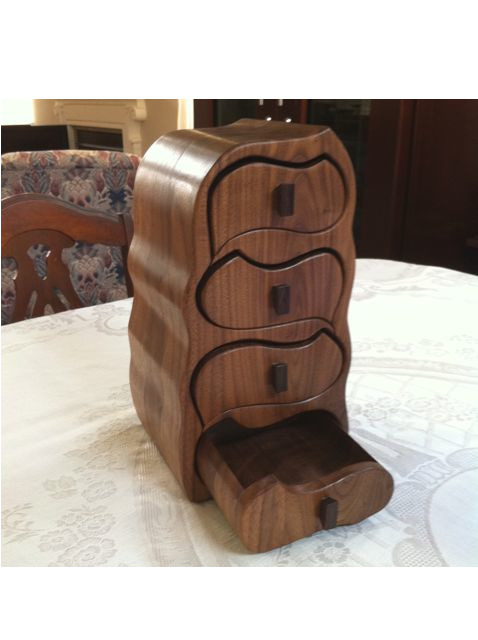 The top is veneered with segments of cherry and curly maple, with a bent lamination of walnut rim. 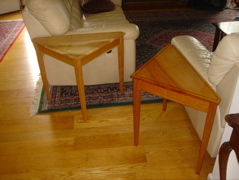 I made this pair of cherry triangle tables with a border inlay. These are a little smaller than David made on his show. The inlay is wenge. David's Butcher Block really "made" our kitchen. It really ties the room together. I developed my own pattern, and added a second shelf. The bentwood lamination apron (one of the classes I took from David) and the leg attachment are true to the one David made on the show. 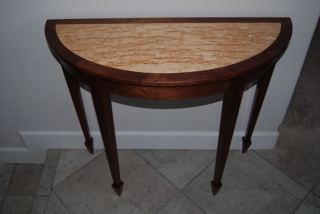 The table is solid walnut, with eucalyptus burl veneer framed in the top. David made a table clock on one episode, which used triangular segments of wenge and maple for the face. That inspired me to make this piece of art for a very good friend. 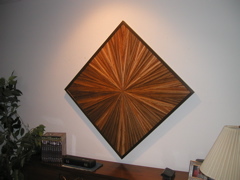 The 60 segments are zebrawood, and the frame is wenge. Mouse over the photo to see how it was used. 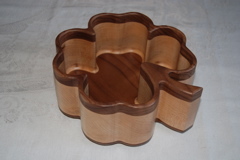 I read an interesting article on routing out bowls, so I bought a bowl bit, made a couple of simple ones, then went nuts with this Four Leaf Clover version. That was a BUNCH of hand sanding of maple. I've made music boxes for my grandchildren. 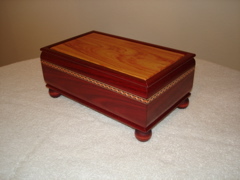 This one is bloodwood with a padauk panel in the lid. I stained poplar spheres from the craft store for feet. I decided to try my hand at a bandsawn box. I made this for a good friend's first baby.